Each domain can have its own custom signature. 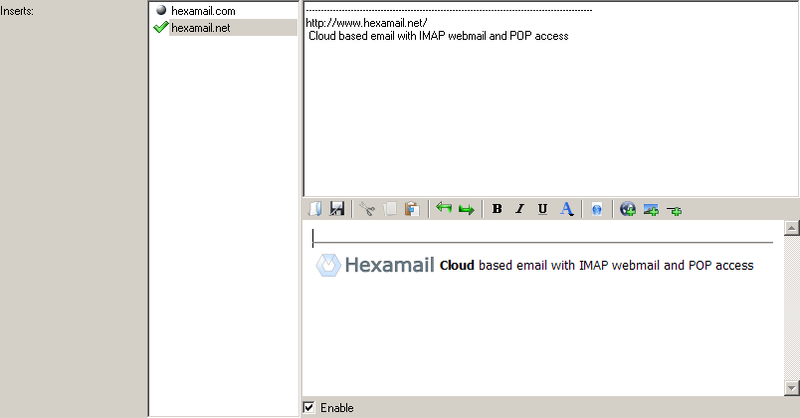 If the domain signature is enabled that signature will be used for all outbound email from that domain. A blank signature instructs legitimizer to not add signatures for that domain, a disabled domain specific signature will make it use the default, if the default signature options are enabled. Each domain can have its own signature. The DomainSignature corresponding to the domain configured will be added to all outbound email from the domain. The DomainSwitch parameter allows you to turn on/off domain signatures for individual domains. A blank signature instructs legitimizer not to add signatures for that domain. A disabled domain signature (e.g. DomainSwitch0=Off) instructs legitimizer to use the default signature (if default signatures are enabled). You can use: <company> to insert the licensed company name automatically <domain> to insert the domain into the signature automatically. <from>- the address of the person sending the email <fromdisplay>- the displayed name of the person sending the email <recipient>- the list of recipients of the email This signature is a text signature that is added to text based email. 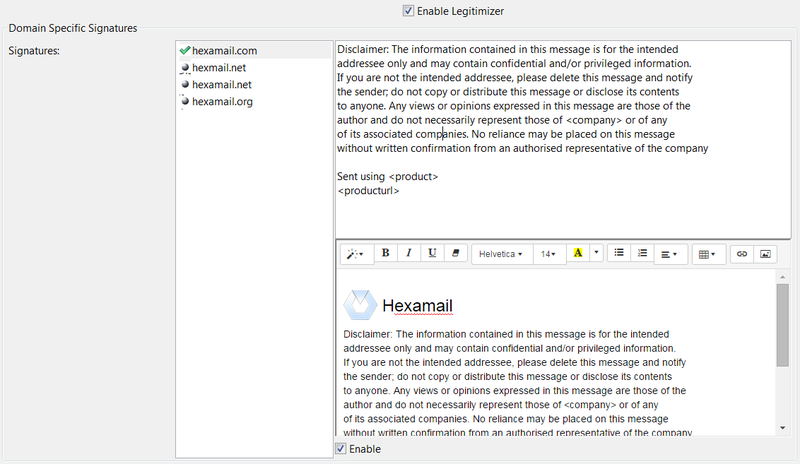 If you do not specify an HTML signature, the text signature will be automatically converted to HTML and used in any HTML email requiring a signature. Example: The information contained in this message is for the intended addressee only and may contain confidential and/or privileged information. If you are not the intended addressee, please delete this message and notify the sender; do not copy or distribute this message or disclose its contents to anyone. Any views or opinions expressed in this message are those of the author and do not necessarily represent those of <domain> or <company> or of any of its associated companies. No reliance may be placed on this message without written confirmation from an authorised representative of the company.